Convenient parking is available near the Metrotech Business Improvement District (MTBID). 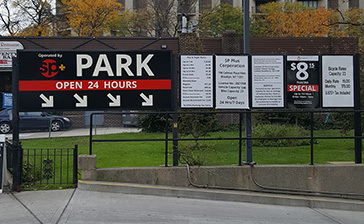 Click on a location name for parking information including: daily/monthly parking rates, hours of operation, and garage entrances. Located in the heart of Downtown Brooklyn, MTBID is home to the Metrotech Center, a 16-acre property featuring offices for major corporations, media and advertising companies, and academic institutions including: JP Morgan Chase, National Grid, Empire Blue Cross Blue Shield, El Diario La Prensa, Uniworld Group, and Polytechnic Institute of NYU.